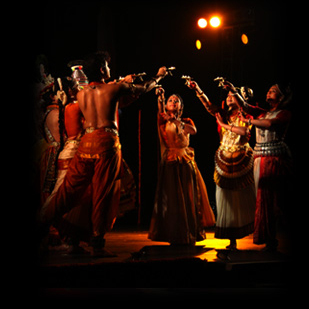 SANNIDHI meaning flowing together is a production on the seven sacred rivers of India. Commencing with chants from Shatpath Brahman paying obeisance to Water and establishing it as the Ultimate and the Only truth and the origin of All; the production brings about different imageries of the seven sacred rivers. The seven dance forms – Odissi, Kathak, Bharatnatyam, kuchipudi, mohiniattam, Kathakali and Manipuri are symbolically represented by 7 sacred rivers. Selected mantras from the Vedas, verses from Puranas and other sacred compositions for the literary basis of Sannidhi. Sacred water of River Saraswati is described as holy as the offerings in the divine vedic rituals of the great sages. Narmada, revered by Brahma, Vishnu and Shiva flows endlessly blessing her bhaktas experiencing the Narmada Parikrama. Blessed by Shiva and Brahma, Kaveri Rishi’s daughter Kaveri serves the mankind through her generous flow. The mighty Sindhu river is flows riding a chariot of waves with the thundering sound of a Vajra. The supreme mother Godavari flows selflessly for her bhaktas caressing and nourishing them and giving them the utmost satisfaction in her Ghaats that can experienced by a child with his mother. River Yamuna, the witness to all the leelas of Lord Krishna is asked to wash away all the worldly sins. The celestial River Ganga, flows from the locks of Shiva’s locks of hair, is the Goddess of the three worlds who is worshipped by all asking her to shower her blessings and show the divine path. A tradition is often metaphorically associated with a river of time that nourishes mankind. Similarly, our dance heritage that originated thousands of years ago has evolved over the centuries and is intrinsic to our cultural consciousness. Sannidhi is an attempt to articulate the diversity of expression manifested through each form, culminating in the confluence depicted through melodic and rhythmic interplay juxtaposed with gestural patterns.